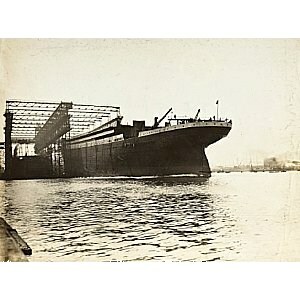 The RMS Titanic left Southampton on the 10th April 1912 headed for New York. Four days later she hit an iceberg and on the 15th April she sank. The sinking of Titanic caused the deaths of 1,514 people in one of the deadliest peacetime maritime disasters in history. One hundred years on the Titanic story still holds enormous interest with historians, collectors and the general public. Films, documentaries and series abound and with the 3D version of Titanic hitting the cinemas public interest is at an all time high. The wreck of the Titanic was rediscovered in 1985 and thousands of artefacts have been recovered from the sea bed and put on display at museums around the world. The wreck of the Titanic remains on the seabed, gradually disintegrating at a depth of 12,415 feet (3,784 m). Pictured left: An extremely rare original launch ticket with its perforated admission stub still intact (pre-sale estimate $50,000-70,000). 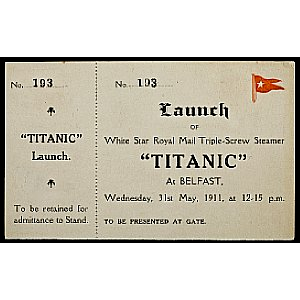 This is the only complete Titanic launch ticket known to exist and would have allowed admittance to the launching and christening of this historic vessel. In an unusual step away from tradition, White Star Line and Harland & Wolff did not christen R.M.S Titanic, and many believe this was the beginning of the end for the supposedly unsinkable ship. Image Copyright Bonhams. In commemoration of the centennial anniversary of the R.M.S. 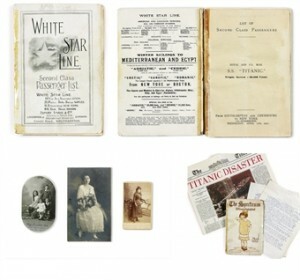 Titanic’s ill-fated voyage, Bonhams will be offering a wide variety of rare Titanic memorabilia for its April 15 auction. Gregg Dietrich, Bonhams Maritime consultant, states, “The interest in the Titanic far surpasses the sinking or wreck of any other ship, making it an historical ‘bookmark.’ This finely curated auction is completely dedicated to the finest and rarest Titanica that has come to market recently.” The auction includes an extremely rare original launch ticket as well as movie memorabilia from the original 1953 Titanic film as well as the James Cameron 1997 version. Pictured left: A pair of photographs of the ship under construction circa 1911 – the first a bromide print, signed with initials and numbered on the lower left “91568/R.W.”, and showing a detail of the stern from the water prior to launch and marked on the back “S.S. Titanic – 3 copy”; the second a bromide print, of the ship from the water coming down the ways and into the river, unsigned and marked on the back “S.S. 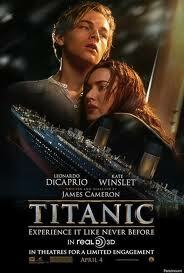 Titanic – 6 copy/not for publication”. Image Copyright Bonhams. The Titanic’s passengers included some of the wealthiest people in the world, as well as over a thousand emigrants from Britain, Ireland, Scandinavia and elsewhere seeking a new life in North America. The ship was designed to be the last word in comfort and luxury, with an on-board gymnasium, swimming pool, libraries, high-class restaurants and opulent cabins. She also had a powerful wireless telegraph provided for the convenience of passengers as well as for operational use. Though she had advanced safety features such as watertight compartments and remotely activated watertight doors, she lacked enough lifeboats to accommodate all of those aboard. Due to outdated maritime safety regulations, she carried only enough lifeboats for 1,178 people – a third of her total passenger and crew capacity. Pictured right: A selection of eight post disaster R.M.S. 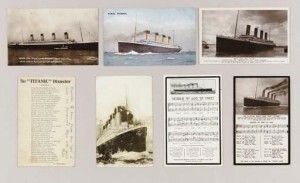 Titanic postcards including: an (unused) “Nearer My God To Thee!” with an image of the ship and the music and lyrics to the song, published by national Series in black and white; an (unused) “R.M.S. Titanic” published by J. Salmon, printed in color; an (unused) “Entrance To Belfast Harbour.” printed in sepia; an (unused) The Ill-Fated White Star Liner ‘Titanic'”with a photo of the ship in sepia, and the music and lyrics to the hymn Nearer, My God To Thee; an (unused) “The Ill-Fated S.S. Titanic. Foundered April 15. 1912″ printed in sepia; an (unused) “White Star Triple-screw Steamer ‘Titanic’ 45,000 Tons.” a sepia photo published by Batcelder Bros., Crayden; an (unused) “White Star Liner Titanic.”, published by Rotary Photographic Series, in sepia; a (addressed and post marked May 6, 1912) “The ‘Titanic’ Disaster”, a poem by A. Hunnable in black and white. Sold for $840 at Christies, New York 2007. Image Copyright Christies. After leaving Southampton on 10 April 1912, Titanic called at Cherbourg in France and Queenstown (now Cobh) in Ireland before heading westwards towards New York. On 14 April 1912, four days into the crossing and about 375 miles south of Newfoundland, she hit an iceberg at 11:40 pm (ship’s time; UTC-3). The glancing collision caused Titanic’s hull plates to buckle inwards in a number of locations on her starboard side and opened five of her sixteen watertight compartments to the sea. Pictured left: A rare list of second class passengers for the R.M.S. Titanic carried off the ship by Miss Bertha Watt and other related material. Sold for $56,250 at Christies, New York, June 2008. Image Copyright Christies. Over the next two and a half hours, the ship gradually filled with water and sank. Passengers and some crew members were evacuated in lifeboats, many of which were launched only partly filled. A disproportionate number of men – over 90% of those in Second Class – were left aboard due to a “women and children first” protocol followed by the officers loading the lifeboats. Just before 2:20 am Titanic broke up and sank bow-first with over a thousand people still on board. Those in the water died within minutes from hypothermia caused by immersion in the freezing ocean. The 710 survivors were taken aboard from the lifeboats by the RMS Carpathia a few hours later. 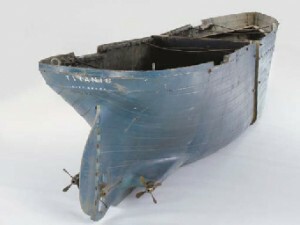 Pictured right: PROP TITANIC HULL FROM “TITANIC” 20th Century Fox, 1953 – A scaled-down model (though still huge) of the Titanic’s hull used in many scenes to show the oceanliner falling apart in the Academy Award-winning film that starred Barbara Stanwyck, Clifton Webb and Robert Wagner. Made in two separate sections and painted a teal blue, this piece is constructed out of metal and wood and still displays interior gear mechanisms which worked at one time. Stencilled on the stern in white paint is Titanic/Liverpool and on one side is a large gash indicating where the iceberg hit. This film was considered to be a masterpiece of special effects in 1953, and was the inspiration for the 1997 version starring Leonardo DiCaprio and Kate Winslet. Sold for $598 at Christies, New York, 2003. Many of the survivors lost all of their money and possessions and were left destitute; many families, particularly those of crew members from Southampton, lost their primary bread-winners. They were helped by an outpouring of public sympathy and charitable donations. Some of the male survivors, notably the White Star Line’s chairman, J. Bruce Ismay, were accused of cowardice for leaving the ship while people were still on board, and they faced social ostracism. RMS Titanic, Inc., doing business as The Titanic Store, was formed for the purpose of exploring the wreck of the RMS Titanic and the surrounding ocean areas. The goal of RMS Titanic, Inc., is to retrieve artifacts and obtain oceanographic and scientific data, and then use that data and the retrieved artifacts for historical verification, scientific education, and public information. Pictured left : Limited Edition 100th Anniversary Ornament There are only “1912” of this Titanic Limited Edition handpainted ornament commoerating the 100th Anniversary. 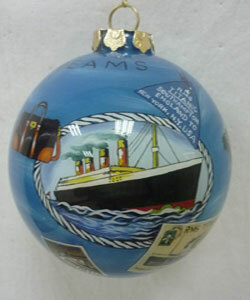 Each ornament is numbered and features many elements of life on the ship and authentic artifacts such as jewelry, china, boarding passes and more. It is the Company’s purpose to preserve the memory of Titanic and all those who sailed with her, and to promote that memory with respect and regard for the Ship’s historical and maritime significance. The Company was granted salvor-in-possession rights to the wreck of the RMS Titanic by a United States Federal Court order in 1994. That order was reconfirmed in 1996. This award includes the exclusive rights to recover artifacts from the wreck site. During seven research and recovery expeditions conducted in 1987, 1993, 1994, 1996, 1998, 2000 and 2004, RMS Titanic, Inc. has recovered 5,500 artifacts, ranging from a massive 17-ton portion of the hull to a delicate child’s marble measuring only one-half inch in diameter. RMS Titanic, Inc. maintains a comprehensive digital archive of these recovered and conserved artifacts as well as photographic data from the site. 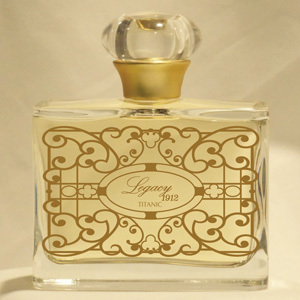 Pictured right: “Legacy 1912 Titanic” Exclusive fragrance – “Legacy 1912 Titanic” Perfume, 75 ml. This item will ship in July 2012. This fragrance was inspired by the original vials of Mr Adolphe Saalfeld, a 1st class passenger and survivor of the Titanic who was hoping to sell his scents in New York City. The fragracne has hyacinth, lemon*, blushing rose*, orange blssom and violet,(*similar to actual raw material essences that were recovered from the Titanic site). As the only entity that has recovered and conserved objects from the Titanic, RMS Titanic, Inc. is in the unique position to present an unprecedented visible and tangible experience of the Ship from her conception and her tragic loss to the scientific magic of her discovery. Interest in the Titanic looks set to continue during the centenary of the tragedy with exhibitions, movie releases and specialist auctions. A simple search on ebay shows thousands of results ranging from original documents, replica documents, movie memorabilia and props, posters, mugs, plates, coins, clothing and more. When buying original material try to get provenance where possible. On a final note in James Cameron’s film Why does Rose throw the Heart of the Ocean?